Tracking your search engine optimization analytics doesn't need to be a time-consuming chore. DashThis' automated SEO reports make keeping on top of your SEO efforts a breeze. Link all of your SEO tools to DashThis and we'll do the rest for you. We support everything from Google Analytics to Google Search Console to Ahrefs to Moz to SEMrush. You can even send out reports automatically if you want: just create a mailing list. Use one of our preset widgets or create your own widgets to track your KPIs. You can track everything from organic traffic to organic search rankings to keyword rankings and everything in between. Our report templates are fully customizable so you can present your SEO data just how want it. You can add logos and comments, merge data, and so much more. It's your data - display it the way you want. We support the major SEO tools you're probably using to track your SEO campaigns. But we also support the major digital marketing tools for paid search and PPC (AdWords & Bing), web analytics and social media. 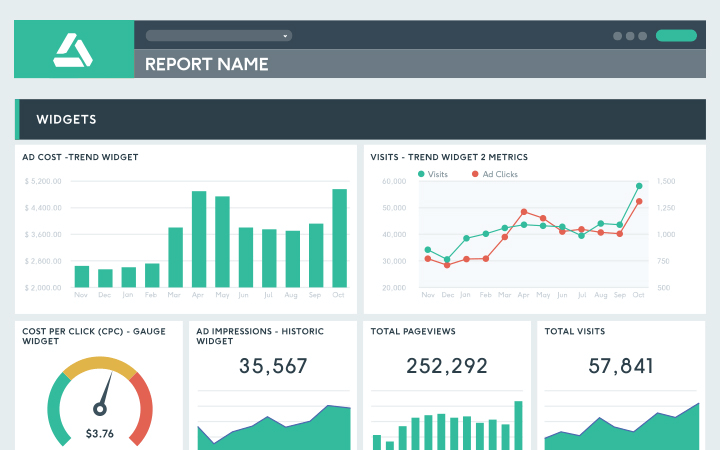 With DashThis, you can have all your digital marketing data in one convenient dashboard. Have some custom data? No problem! Just upload the data in a CSV file. SEO reporting lets you show the value of your work to your clients. It doesn't need to be a tedious and time-consuming process - that's why we started DashThis. These marketing agencies (and many more!) are using DashThis to save time so they can do what they do best: create killer online marketing campaigns. We aim to provide a complete SEO software that keeps the reporting process as simple as possible. You can start with a preset template dashboard or you can build your own from scratch. And best of all, there's no coding involved in customizing reports. Detailed reports that are easy to create - sounds pretty good, right? Think about how much time (and money) you'll save if you automate reporting. Now think about what you can do with all that time you'll save doing your regular reporting: you and your team can spend more time optimizing your client's website and working on digital marketing projects, which means bigger profits. Sounds like a win-win to us. Save on a custom URL and design with a white label bundle that includes both! An SEO report just the way you want! Our SEO automatic report template has everything you need to get started. The standard SEO KPIs are already plugged in so all you have to do is link your data sources. The templates are also customizable so you can visualize the data exactly how you want. DashThis isn't just an epic SEO reporting software with the features you need. It's also an awesome group of people here to give you a helping hand with your client reporting whenever you need!